Now that they've won Olympic medals, PV Sindhu and Sakshi Malik are being showered with cash prizes by government agencies. Even Dipa Karmakar and Lalita Babar are in line for cash awards. Sindhu has, by our count, already been promised Rs 13 crore and Sakshi Rs 5.6 crore, while Lalita and Dipa will be given Rs 15 lakh each. These figures could rise. Now compare these amounts with the money spent on these athletes when they needed it the most - while they were preparing for the Games. The sports ministry runs a special programme for improving India's medal prospects in the Olympic games called the Target Olympic Podium (TOP) Scheme. 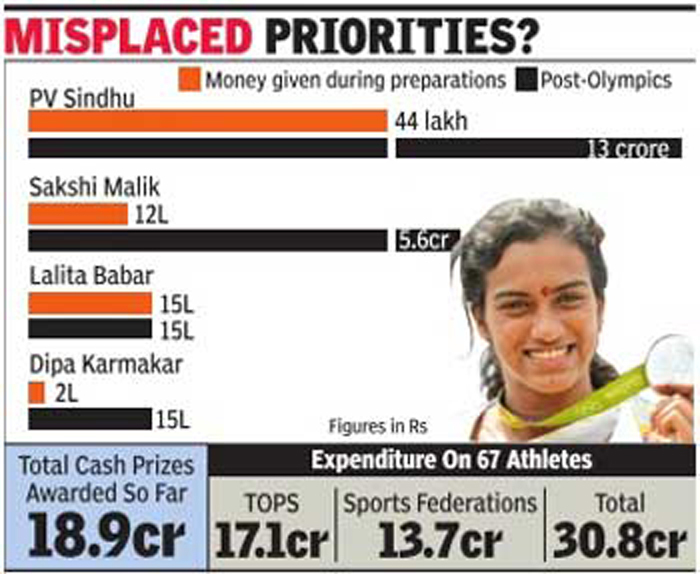 Under this scheme and from funding through sports federations, Sindhu was given Rs 44 lakh while Sakshi got Rs 12 lakh. That's 3.4% of Sindhu's post-medal awards and 2.1% of the money Sakshi is to get. Dipa, who finished fourth in the vault, got only Rs 2 lakh for Olympic preparation under TOPS. It, therefore, appears that while most countries spend money on building medal winners, India has a unique model where the money pours in after you have won. Of the 118 athletes who represented India at Rio, 67 were funded by TOPS and received a total of Rs 17.1 crore. That's less than the amount now being showered on Sindhu and Sakshi. Apart from TOPS, an additional Rs 13.7 crore of assistance was provided to these 67 athletes through various national sports federations, taking the total expenditure on them to Rs 30.8 crore. About 60% of the money is now being lavished on the two medal winners as governments scramble to bask in reflected glory. India's strange funding model is evident also in the fact that the Indian Olympic Association announced a prize of Rs 50 lakh for winning gold, Rs 30 lakh for silver and Rs 20 lakh for bronze. The Railways, the Haryana government and other government bodies also promised cash awards and other goodies for medal winners. While nobody would grudge the athletes the cash rewards being given, it raises the question of why this money wasn't available for funding our sportspersons in their preparation. Most Olympic associations across the world give prizes or bonuses to medal winning athletes. For instance, the Singapore government rewarded Joseph Schooling, who won gold in swimming after beating Michael Phelps, a cash prize of 1 million Singapore dollars, of which 20% will be spent in development of the sports. Similarly, the US Olympic committee rewards American Olympians with bonus pay-outs of $25,000 for gold, $15,000 for silver and $10,000 for bronze. But these countries pour much larger sums into the preparations.